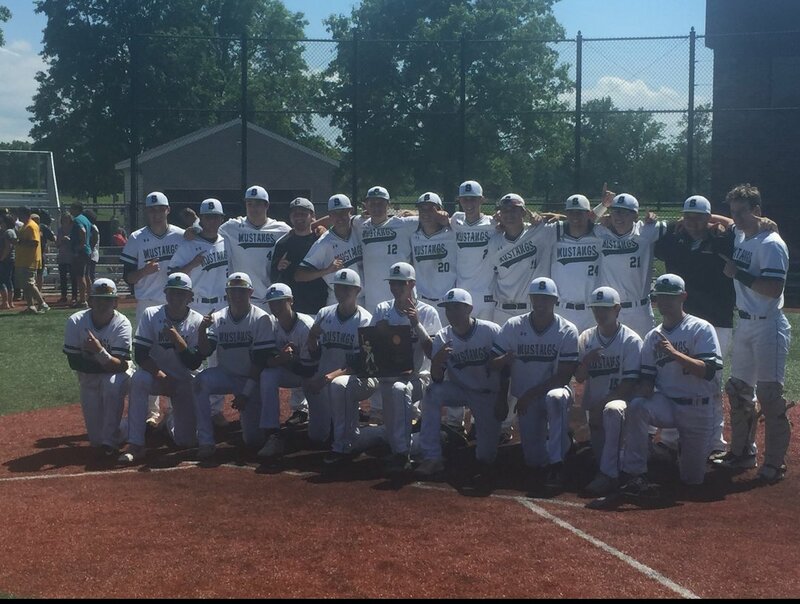 The Strongsville Mustangs defeated Medina 3-2 in a seven inning thriller to head to the state tournament. Medina had a very good chance to get on the board in the first inning, but they left the bases loaded and failed to score. Strongsville scored first as Alex Gray led off the game for the Mustangs with a single followed by another single by Parker Shannon. Gray scored on an error on a ball that just got under the shortstop’s glove. Medina got out of the inning, however, with a 6-4-3 double play. Strongsville led off the third inning with two singles and that was the end of John Curtis’ night, but a 6-4-3 double play brought home a run for the Mustangs. With runners on first and third, Tyler Denning stole second and drew the throw. The throw was high and another run came home for the Mustangs. Curtis went two plus innings giving up two earned runs on five hits. Jaret Beechy breezed through the Medina lineup giving up no runs until the seventh inning. With one out, the Bees’ rally began with a single. Two consecutive walks loaded the bases for Medina. Cade Pipoly came up huge for Medina, hitting a RBI single up the middle. With the bases still loaded and the score at 3-1, Mustangs’ coach Doug Cicerchi brought in Mitch Midea to attempt to close out the game. Beechy went 6.2 innings giving up 2 earned runs on 5 hits and earned the win for Strongsville. Media, before even throwing a pitch, failed to pause before the throw and got called for a balk bringing home another run. After the balk, Strongsville chose to intentionally walk Trace Peterson. With the bases loaded with two outs, and the tying run on third and the go ahead run on second, Aaron Masek walked slowly to the plate. On a 3-2 pitch Masek grounded out to the first basemen and that ended the game. Midea earned the save for the Mustangs. “I feel great,” Media said. “We worked hard for this all year long and this was a goal we had … right when we started. Strongsville will travel to Huntington Park in Columbus, Ohio to take on the winner of Olentangy Orange and Gahanna Lincoln in the Division I State semifinal.